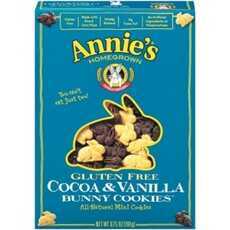 Enjoy Annie's Homegrown Gluten Free Cocoa & Vanilla Bunny Cookies. New Gluten Free Cocoa And Vanilla Bunny Cookies Are As Delicious And Fun To Eat As Our Current Line Of Bunny Grahams, While Addressing A Special Dietary Need. So, Whether Avoiding Gluten Or Not, Families And Friends Can Enjoy The Winning Flavor Combination Of Cocoa And Vanilla Bunny Cookies. (Note: Description is informational only. Please refer to ingredients label on product prior to use and address any health questions to your Health Professional prior to use.